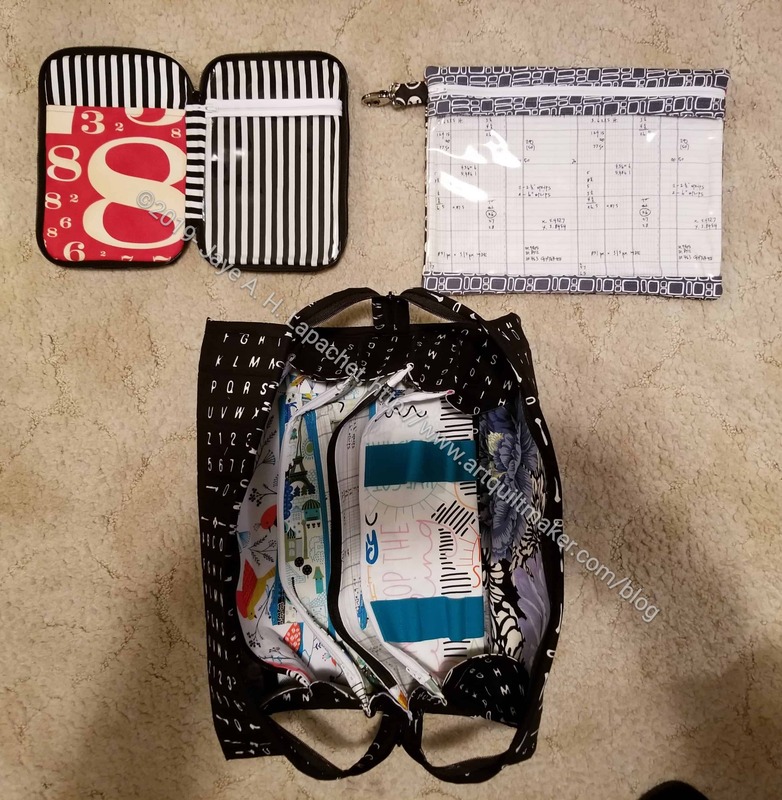 After completing the All Rolled Up Tote, I thought I would layout the massive number of projects in the Crafty Gemini Organizer Club that I have completed. Yes, I have completed 4 projects. I still have 3 more projects to go to complete the club. I do want to make all of the projects since I did sign up and pay for them. 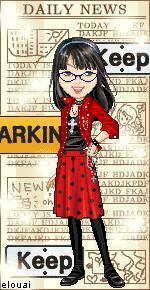 I did not sign up for the subsequent clubs since I have not yet finished the three projects left in the club. Also, I have a lot of other bags and organizer type projects I want to make. 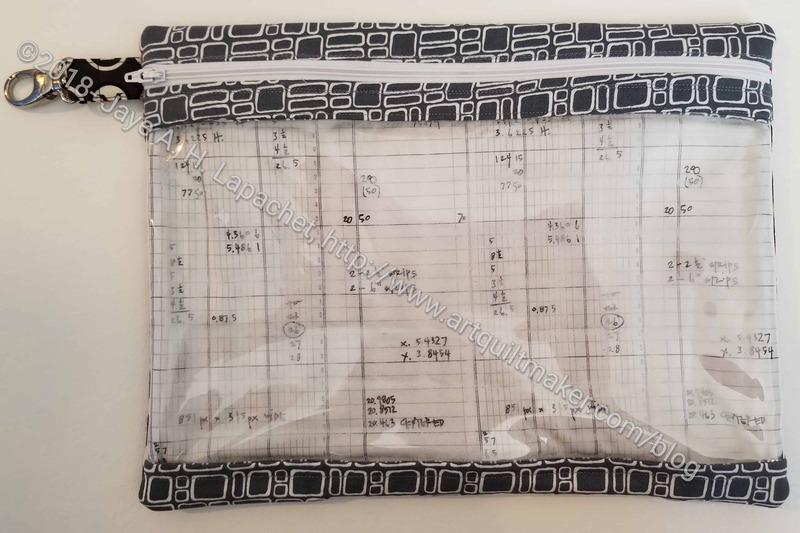 I also want to make another Roadtrip Bag that has a vinyl window rather than using vinyl all the way across the front. I realize that is not the design, but I want to try my design change in order to not have to turn the vinyl. I am not sure how I will use the Roadtrip bag, but I like the design. You can still buy the club (no affiliation). Check out the video showing all the projects. 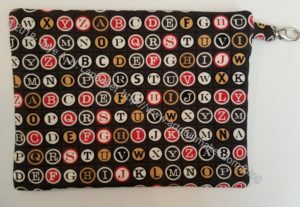 All Rolled Up Tote – Finished!!! I am thrilled to tell you that I finally finished the All Rolled Up Tote! It was a big project. Not difficult, but with a lot of steps. The steps made it somewhat daunting. I say daunting only because the project was unfamiliar and the sheer number of steps seemed impossible to complete. I had done most of the techniques before, if in different patterns, so that wasn’t the problem. I have a new appreciation for video tutorials. The Tote is HUGE. 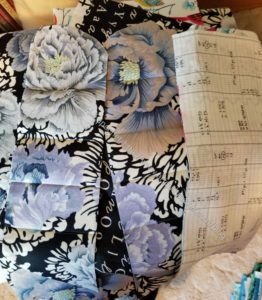 I didn’t really understand how huge until I had sewed the main parts of the project together. It is really hard to understand the size without seeing the thing in person. 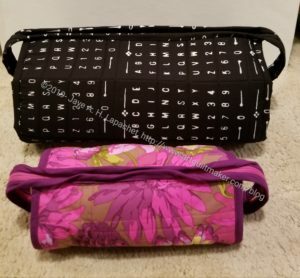 I have included a photo with my most recent Sew Together Bag side by side with the the All Rolled Up Tote for comparison. 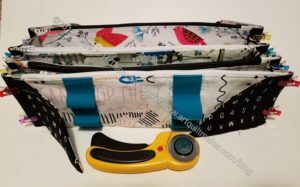 I know many of you are familiar with the Sew Together Bag. I am thrilled that I made such a complicated and different project. 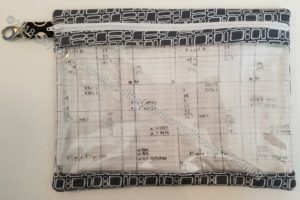 It is similar to the Sew Together Bag, but the construction was different in some places. The other thing I did differently was the front panel (see blue/turquoise vertical strips). This panel calls for a 1/4″ piece of elastic to be installed horizontally. I didn’t want any pens I might want to carry around to be accidentally opened and bleed on to my fabulous Philip Jacobs fabric. I also thought the 1/4″ inch elastic was not sturdy enough and looked a bit cheap. I decided to install wider elastic, which I happened to have, having bought it somewhere along the line. 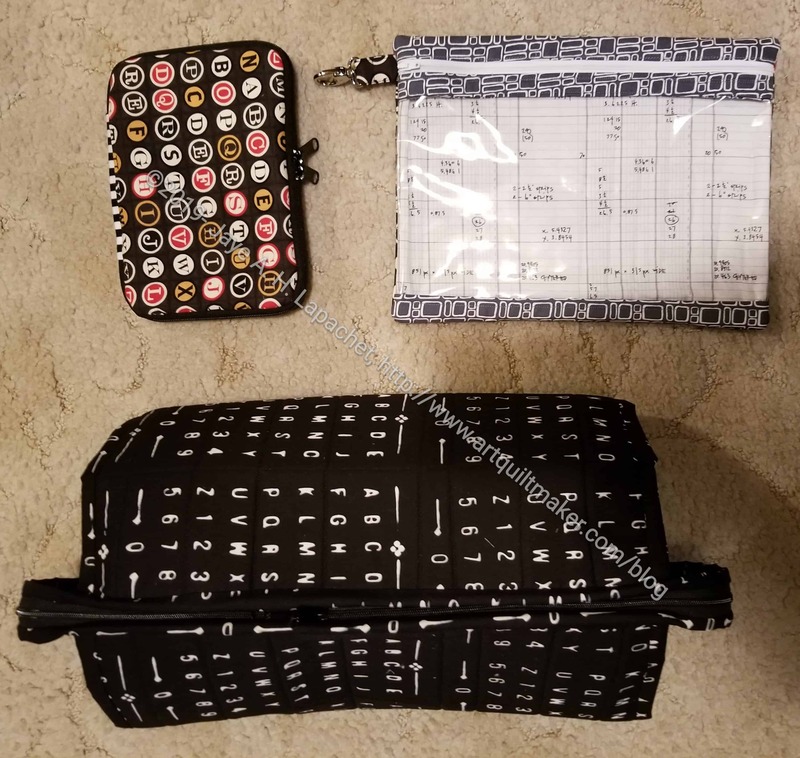 I measured out a few items that I might want to have with me, if I carry this around as a project bag, and sewed the elastic down. I think it looks nice. One thing that was hard to understand without the video was the sleeve. I tried to understand it before watching the videos and it was a mystery. Finally, I watched the videos and could see what it was for. There is an extra area below the pockets (thus the changes in construction in comparison to the Sew Together Bag) where one can store flat items. I put a ruler halfway into the sleeve (see right), so you can see the sleeve. I haven’t tried filling this bag yet as I haven’t quite decided how I will use it, so use of the sleeve may change once I decide. My pouches fit nicely in the Tote. Of course they are the correct size, but my lobster clip plan worked well. It was pretty easy to clip and unclip them from the D-rings on the tote. Crafty Gemini shows putting WonderClips into one of the pouches, which might be a good idea, since I could take the pouch out and put it somewhere if I knew I had to refill it because I had used my ‘on the go’ supplies (like clips) for a project. I also think that these little pouches might make good small gifts. They do require a lot of steps, but are unique as well. 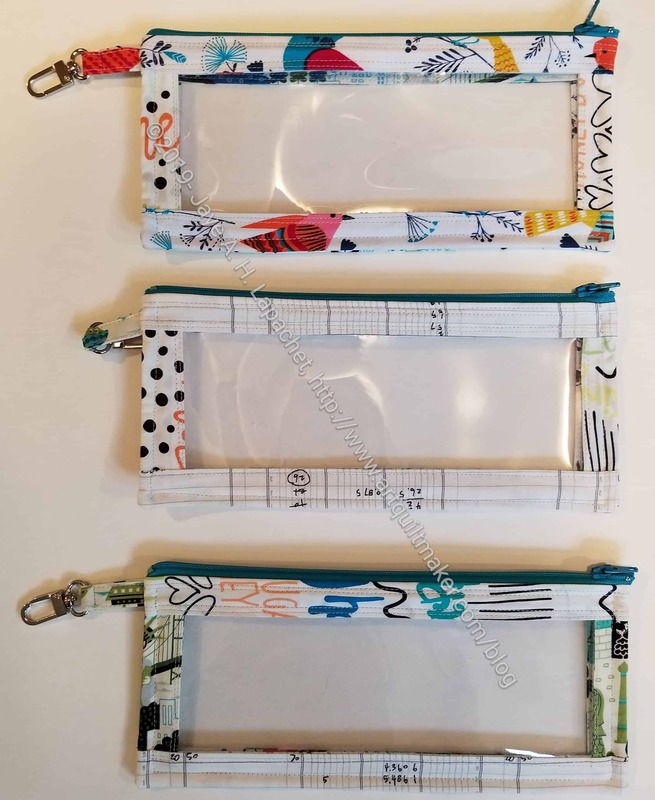 One issue I had with the pouches was zippers. I happened to have zippers that were the exact right size. Crafty Gemini doesn’t say anything about having zippers the right size. In terms of whether we needed to secure ends or add a zipper tab. I might do that next time just to make sure everything was sewn together tightly. I am concerned that the zipper ends will come out. 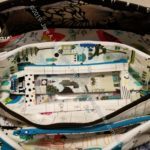 Some of the problems I had with a recent Sew Together Bag were alleviated by the pattern’s suggestion that makers hand sew on the second side of the binding. I did hand sew the second side of the binding. It took me somewhere between 4-6 hours, I think. I am pleased with the way the binding turned out. No sloppy looking stitching because of multiple layers and a cranky sewing machine. I am I still contemplating handles. Some of the other people in the Organizer Club who made this project added handles, but I wasn’t completely happy with their design. If I were to add handles I think that I would like to add them all the way around the bottom of the project in a loop design. I imagine that these would not go over the top of the bag, so access would not be impeded. Off hand I can’t think of other changes I would make to another version of this bag, but I have the feeling I want to make another one. *I*, of course, don’t need another one, but I am sure I know someone who needs it as a gift. 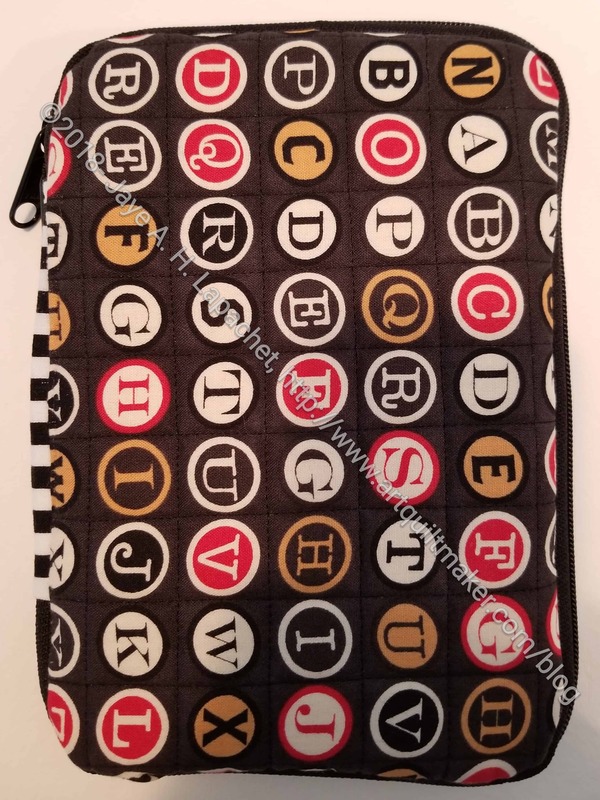 Author JayeLPosted on Thursday, January 24, 2019 Wednesday, January 16, 2019 Categories 2019Tags All Rolled Up Tote, Crafty Gemini Organizer Club, Project-Bag7 Comments on All Rolled Up Tote – Finished!!! 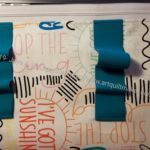 Part of the All Rolled Up Tote pattern includes some pouches that can be clipped on to the D-rings I inserted when installing the pockets. I worked on those over the weekend and was able to finish them up. I am not 100% happy with the zipper ends, but done is better than perfect. They turned out larger than I thought they would. Yes, the finished dimensions were readily available, but somehow I had it in my mind that they were about 3/4s the size. I am pleased with how they turned out. 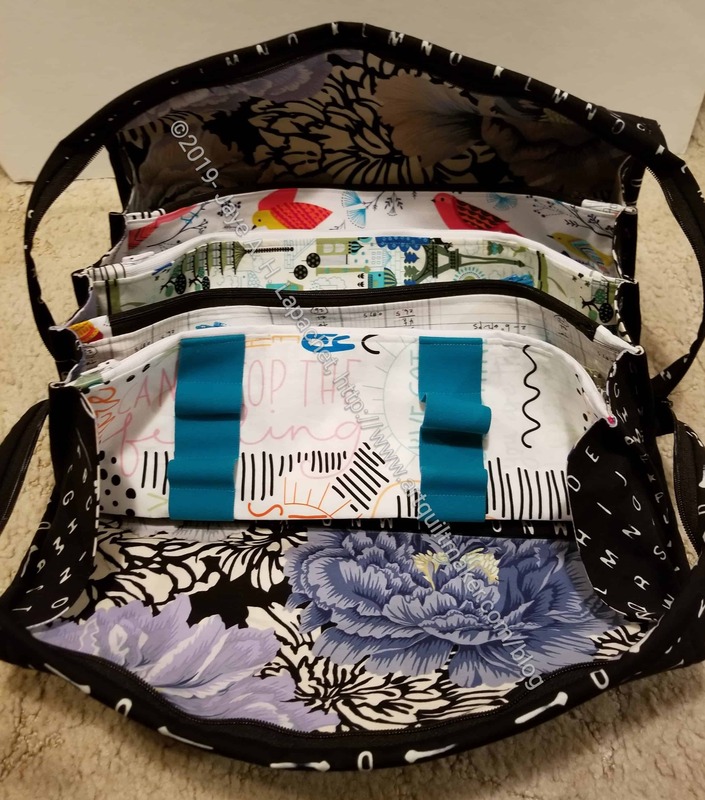 The fabrics are cheerful and they fit well into the Tote itself. I also think the pattern would be useful for gifts to others. Even without the Tote, they could be clipped to other bags. 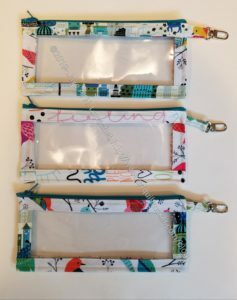 The clips are the one thing I did differently than the pattern suggests. I put the lobster clips on the pouches rather than in the All Rolled Up Tote. I wanted to minimize interference with items I put in the Tote and thought the D-ring in the Tote would be less obtrusive. 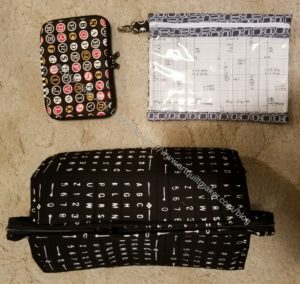 I also thought that I might want to fill these with something that I would want to transfer to other bags, so the lobster clip would allow me to clip the pouch on to other bags without needing that other bag to have a lobster clip. I’ll have to start adding D-Rings to my other bags! I just have a bit more to complete before the All Rolled Up Tote itself is complete. The All Rolled Up Tote is finally starting to look like something. 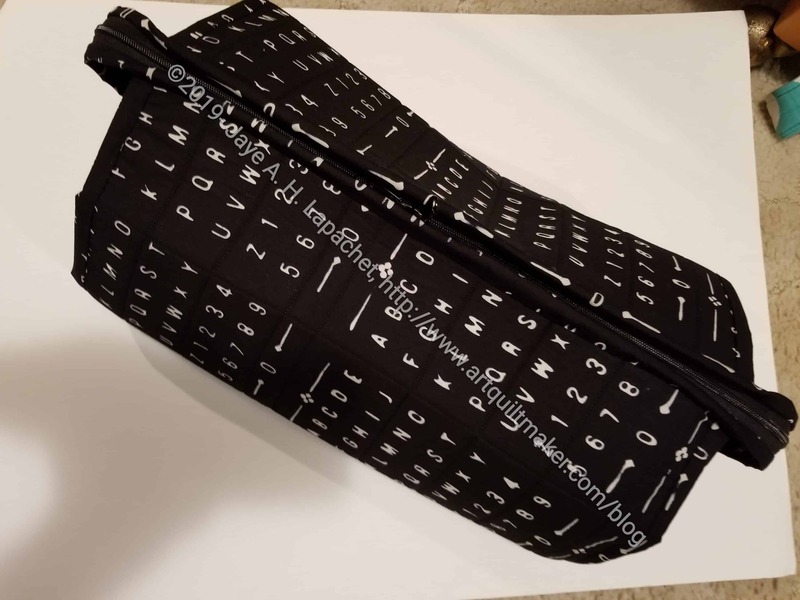 It is amazing to me how I can sew and sew on a bag project and it looks like a bunch of disparate parts, then all of a sudden it looks like something. It’s like magic. Just as I needed the sides, the fabric arrived from HipStitch and I had time to wash it. For once I cut the outside properly and was able to move forward. 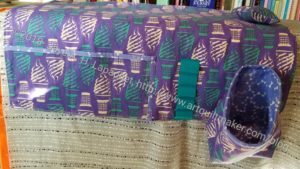 As I said, it is similar in shape and use to the Sew Together Bag, but much larger. The finished size is 15in./L x 9in./W x 6in./H. I placed my rotary cutter in the photo above so you could get some idea of scale. This bag is much larger than the Sew Together Bag. I am also finding the construction to be a little different. 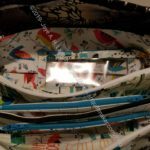 For example, the pockets are assembled separately unlike the Sew Together Bag. I am sure I will find some other differences when I get farther along. 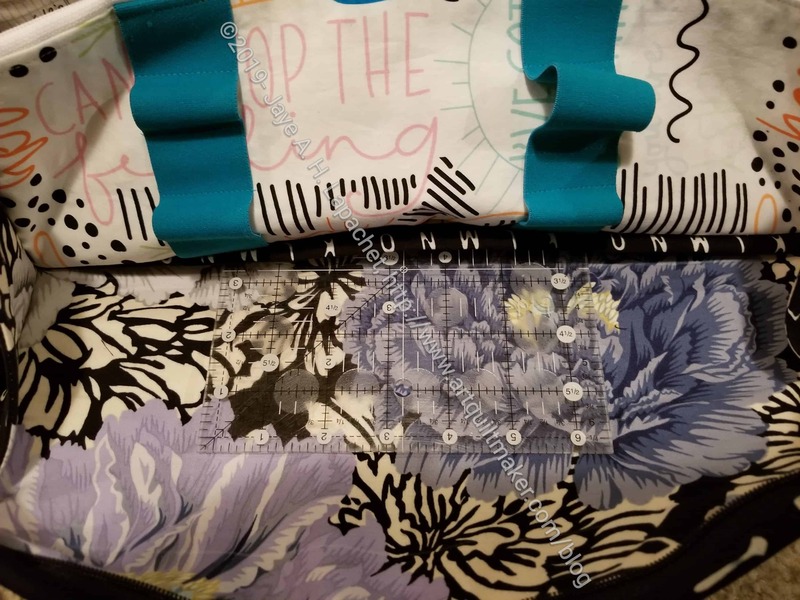 I finished the pockets for the All Rolled Up tote. 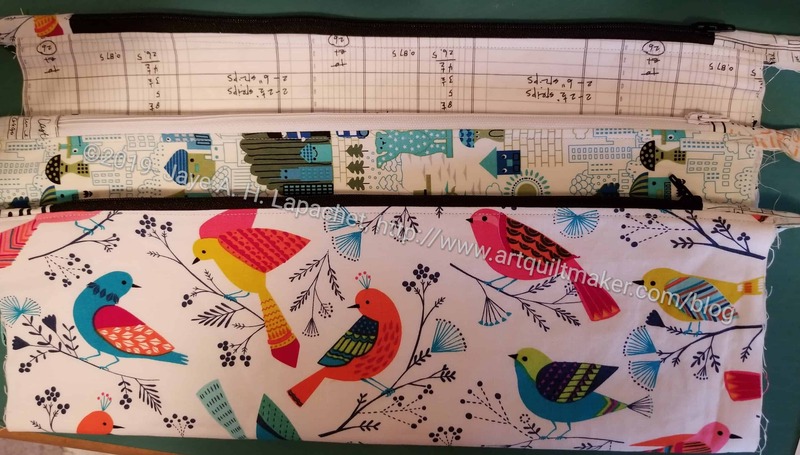 As mentioned, this is part of the Crafty Gemini 2018 Organizer Club. You can buy the stand-alone pattern on her site. Above three of the pockets are shown. I have decided to alternate where the zippers start to lessen bulk. 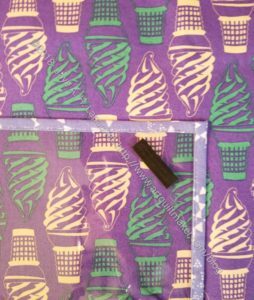 The first pocket, which will go in the front of the bag has elastic on it for writing implements, glue sticks, etc. 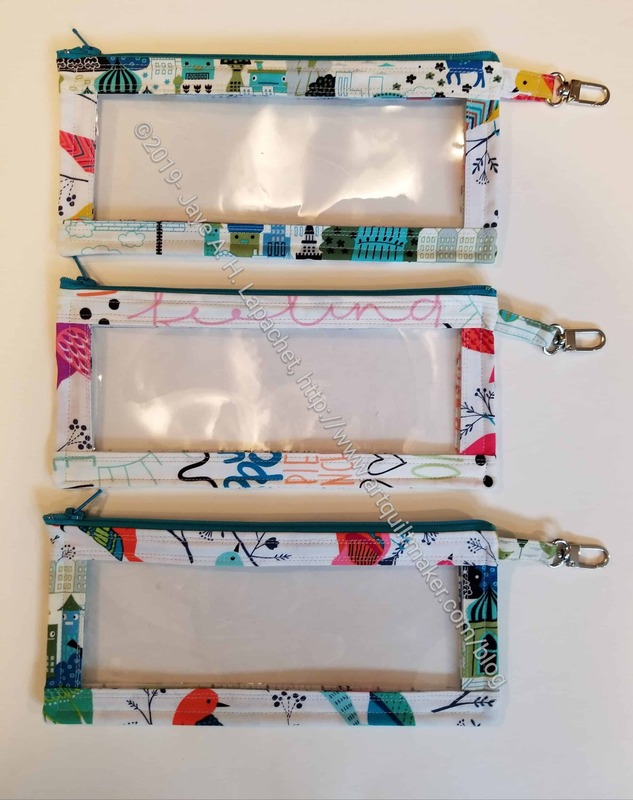 the pattern calls for a 1/4″ piece of elastic placed horizontally all the way across. I thought a thicker elastic placed vertically would work better for me. I didn’t want tips of pens to be too close to the fabric in case they should open and stain. I am also not a fan of that 1/4in. elastic. I think it looks a little cheap. My fat turquoise elastic (I wish I could remember where I bought it in case I want to make another) looks super fun as well. 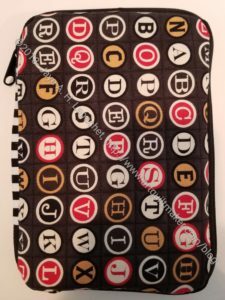 I am working very slowly on this All Rolled Up Tote bag, but I am making some progress. I started cutting back in September and haven’t really put it on the front burner until now. 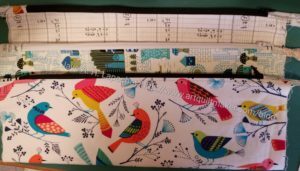 It is part of the Crafty Gemini Organizer Club that I bought last year. I bought the course and am determined to finish all the bags in it. I have made several and plan to alternate them with quilts in the beginning of the year. It isn’t difficult, but the bag has a lot of steps. It is similar in shape and use to the Sew Together Bag, but much larger. 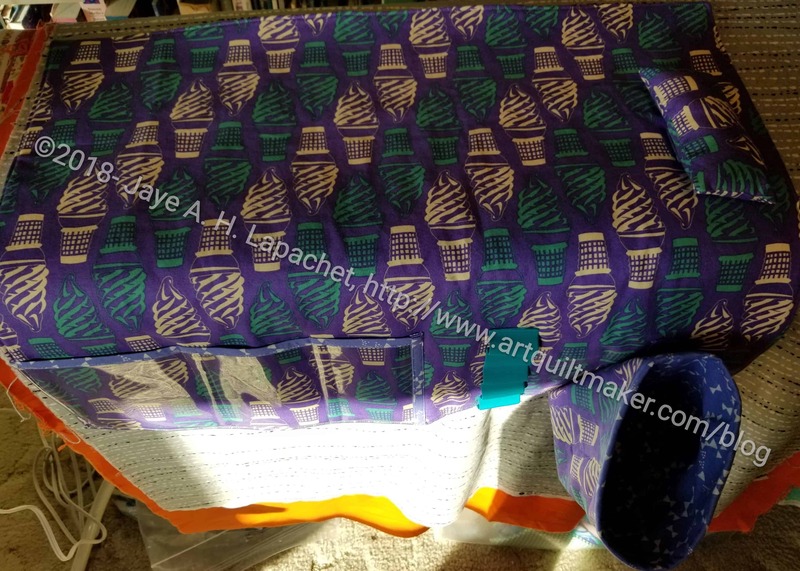 The finished size is 15″L x 9″W x 6″H. I am also finding the construction to be a little different. I should have watched the videos before I started cutting, but didn’t think I needed to. I know how to cut, but there are some tips and tricks. It would have helped. 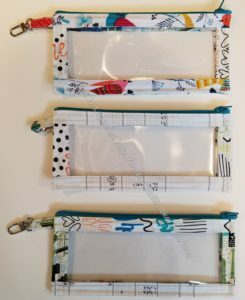 The videos are a great way to make a bag. No fumbling with written directions and trying to figure out what they mean. I don’t even really like watching sewing videos, because I can’t listen to an audiobook while I am watching a video. I am, however, getting more into the swing of video courses. 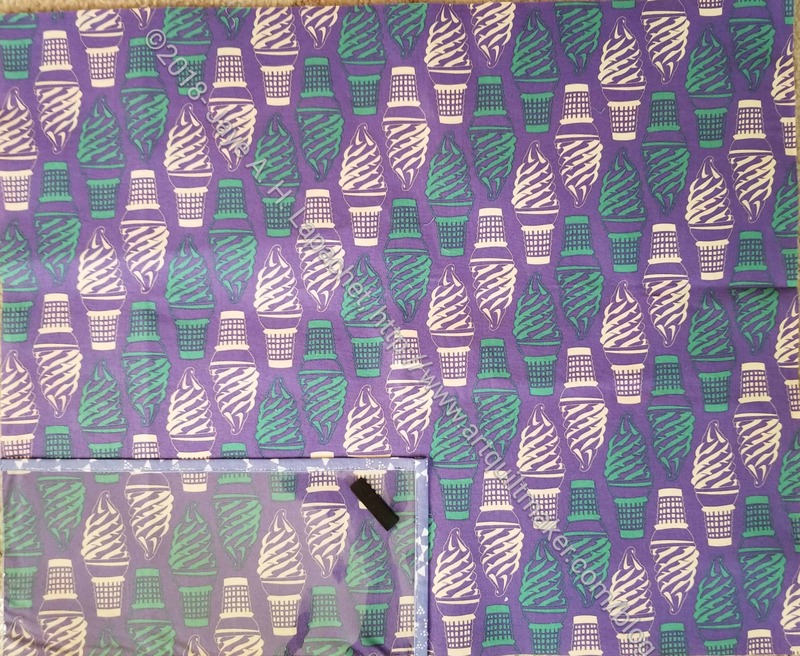 I had to get some more fabric for one outside piece as it was challenging to cut and I cut it wrong. Twice. Bleah. 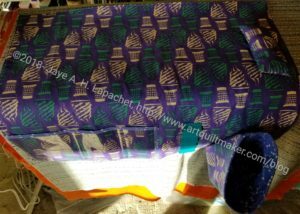 I can continue on and go back to that piece when the fabric arrives. You might remember this mat from back in May? I gave it to Gerre for Christmas so she can use it for retreats. I sent it to her the week before I went to Portland. I made her wait until Christmas to open it, though I really had no control. She told me she really likes it and that makes me happy. Sadly, the photo (above) is the best photo I have of the mat. I’ll try and take a better one when I see it at Sew Day. 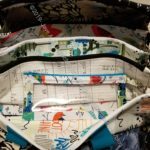 I started cutting for the All Rolled Up Tote Saturday at Sew Day in between the Boxy Bag class. 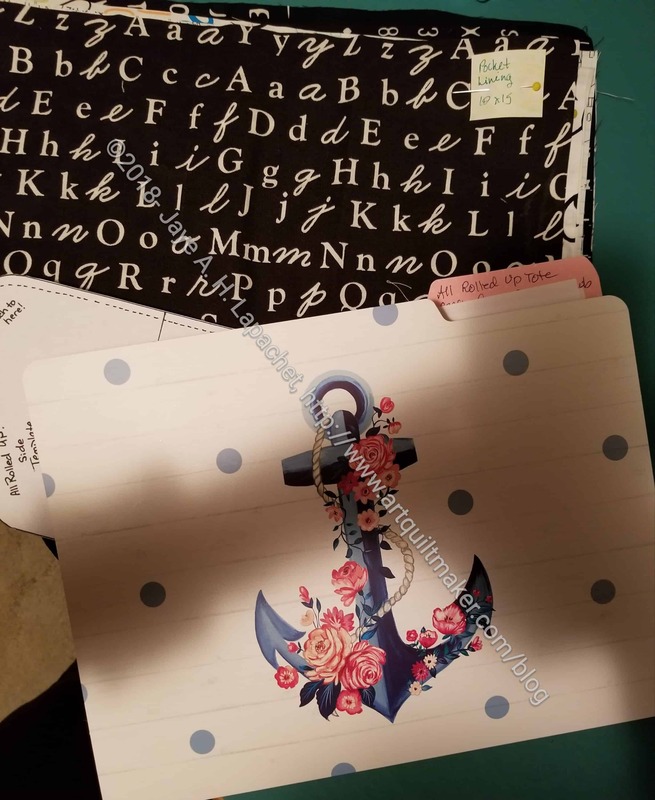 This one of the projects will not necessarily match my other Crafty Gemini projects even though that was the original intention. 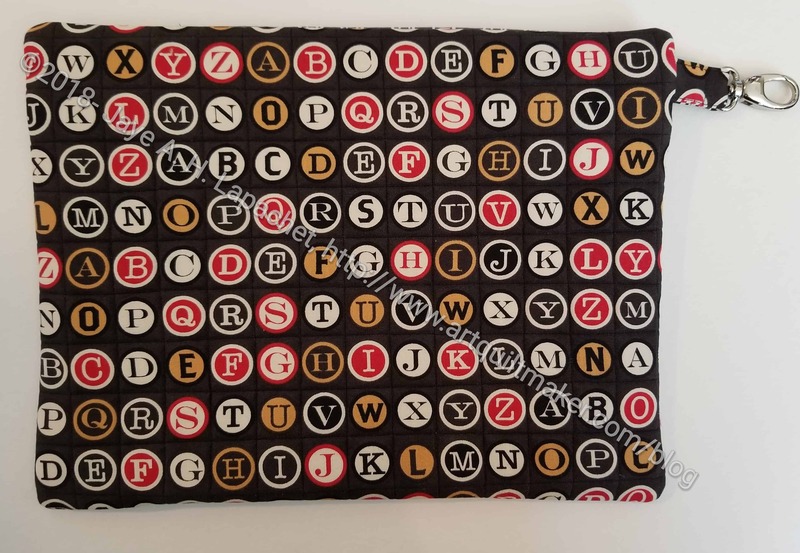 I wanted to use some text fabrics, so I veered away from my original idea. This is sort of the like the Sew Together Bags. I haven’t, however, seen one in person, so I can’t really tell the differences. I do know that it is much bigger than the Sew Together Bag. One website says that the finished size is 15″L x 9″W x 6″T. 6 inches, which is as tall as my square ruler. This will be a large bag. Between this and the Tool Tote, I am not sure how my Go/travel bag is going to change. There are about 2,000 pieces in this pattern and I only got about 653 cut out. I am happy that I got most of the fabric pieces cut out. 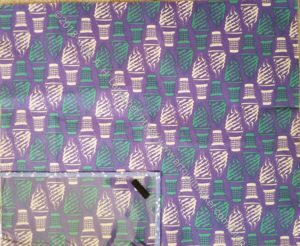 What I have left to cut is batting, fusible interfacing and vinyl. Vanessa at Crafty Gemini loves her clear vinyl! I didn’t print out all of the directions – just the cutting instructions, because I didn’t want to waste ink. I don’t know when I will sew on it, but since I have more cutting to do, it might be some time. I had very little left to do, but it just seemed like something was always grabbing my attention away from sewing. There is a lot of house stuff going on and it just has to be dealt with step by step. There were a couple of things I did differently. 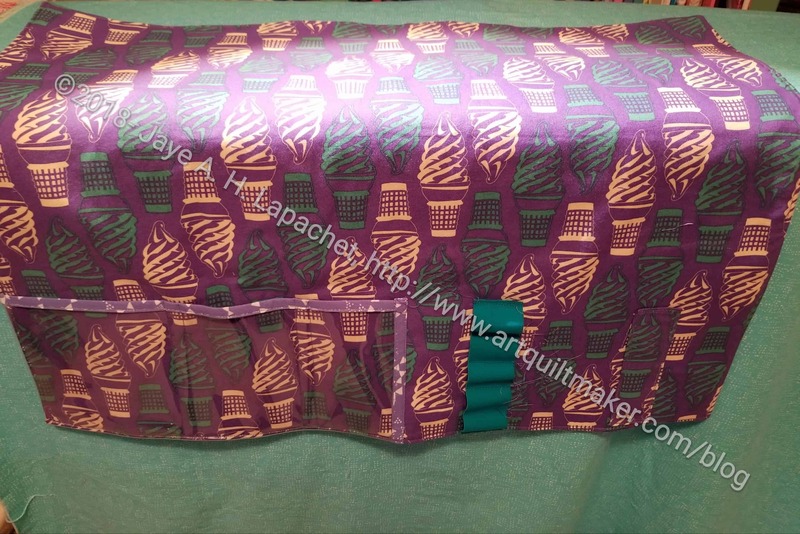 Vanessa of Crafty Gemini called for the threadcatcher to be held on to the mat by a loop (see an image on her site). I thought that design looked weird-I didn’t want stuff hanging off of the mat I was making, so I used sew-in magnets. I used two on the threadcatcher. It will not hold up to heavy garbage, but the threadcatcher is named “threadcatcher” and not garbage can for a reason. Since I had my giant stack (ooops purchase!) of sew-in magnets out, I used a set for the pincushion as well. The pattern calls for a snap. The snap and the loop work fine! I just wanted a little different look. I also made mine a little wider to accommodate a machine with a larger throat. The pattern was really good about mentioning this type of adjustment. I think the project came out very well, but I am not a huge fan of this particular pattern. I think the threadcatcher is too big and somewhat unnecessary. 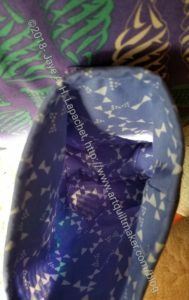 Most of us have a garbage can by our sewing machine. I also think the pink cushion is extraneous. How many pincushions do you have? This is a great piece to have on a retreat where you may not have all of your pincushions or a garbage can nearby. I found a pattern in Issue 35 of Love of Patchwork & Quilting magazine. I am going to make one of those as well – sometime – just to compare. **I had to leave early to go back to work. I really wanted to get this finished on Sunday, but I talked with my Mom for an hour for Mother’s Day. This pattern has committed a sin I am pretty firm on: make small bits first. 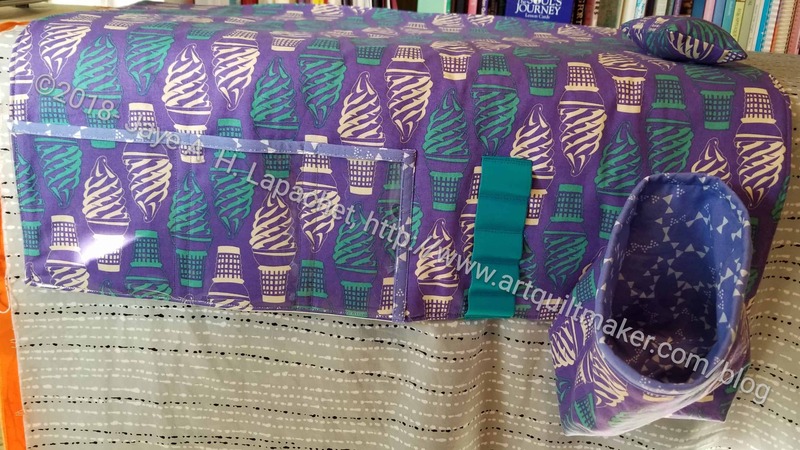 This pattern does not have the maker sew the thread catcher and the pincushion first. I have the whole mat made and need to go back and sew some fiddly bits. I am changing the way the mat looks. I am using sew-in magnets to hold the thread catcher instead of a strap from which the thread catcher can hang. The directions are clever in the way it makes the thread catcher. 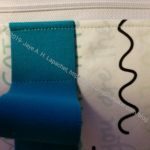 Crafty Gemini uses a larger seam allowance for the lining to make the lining fit inside the thread catcher. I don’t know how the pincushion is attached and will have to figure that out. 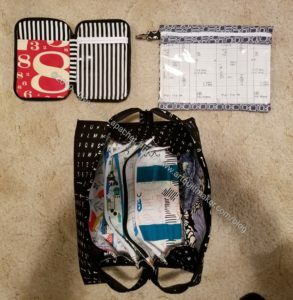 As mentioned back in April, I am a member of the Crafty Gemini Organizer Club. I made a couple of the projects, but haven’t been able to keep up the pace since the beginning of April. After getting the Octagon Nine Patch ready for the quilter, I decided to work on a club project. For reasons you will find out later, this project not going to be part of the set. 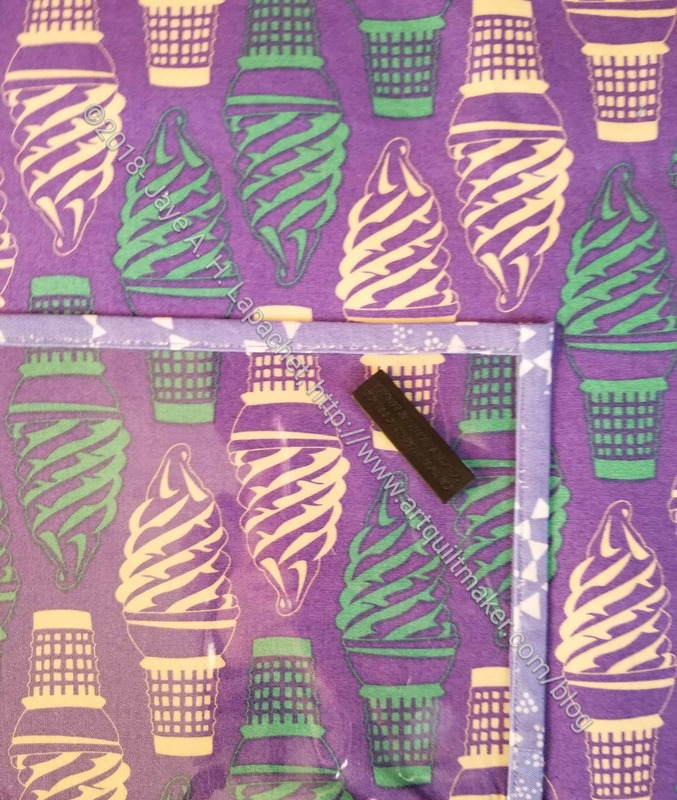 I chose the ice cream cone fabric, because it is super fun. As you can see, I am part way through the project. 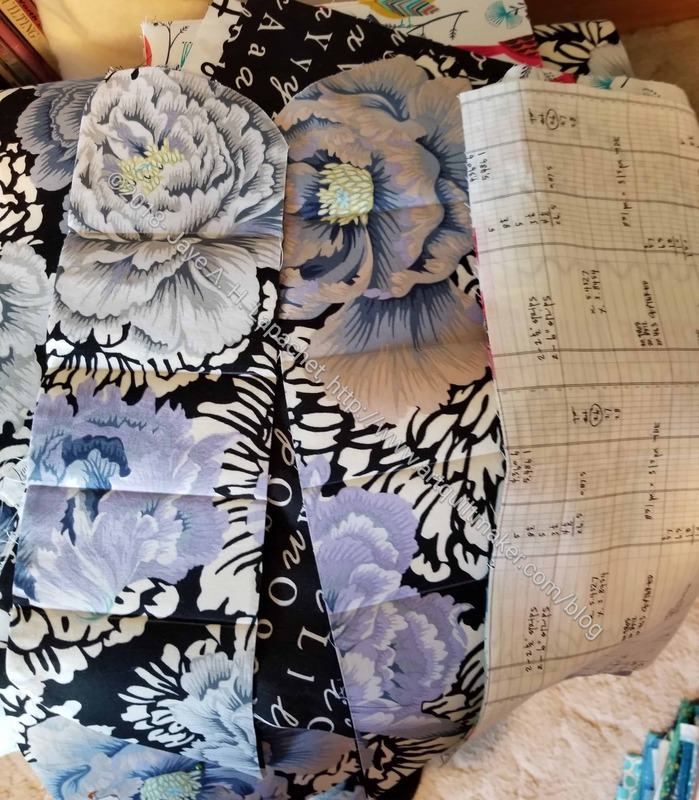 I cut the mat slightly larger than the pattern called for to accommodate larger machines.I have bound the vinyl pocket and basted it to the main fabric, but have gotten no further. 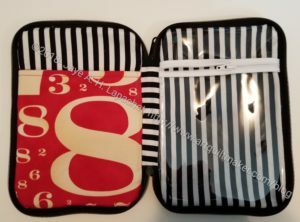 Crafty Gemini projects are known for zippers and vinyl. This project only has vinyl and I have an idea in my mind to make several of them for gifts. I saw another similar project in Issue 35 of Love of Patchwork & Quilting magazine. It looks very similar with a few differences. I am thinking of making that one to compare the two projects. Stay tuned to see if I do it. I have a lot of plans for gifts. 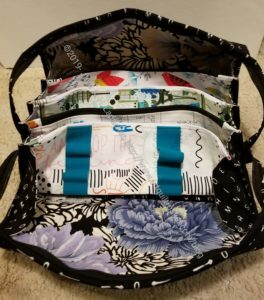 I thought I had mentioned the Crafty Gemini Organizer Club, but I can’t find a mention of it. 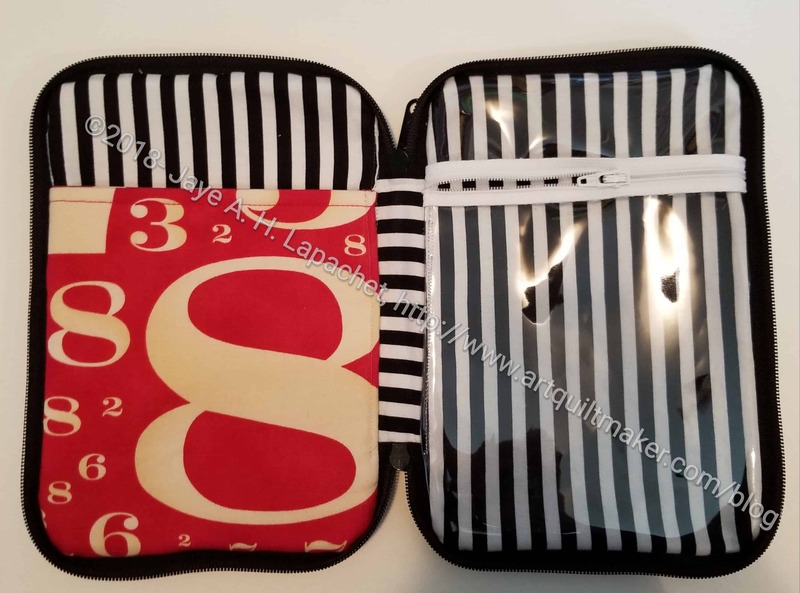 Angela is helping with a bag project on which I am working and she pointed me to the Crafty Gemini Organizer Club. I looked at it, watched the video of the bags the club would be making and thought about it. Finally, I joined. 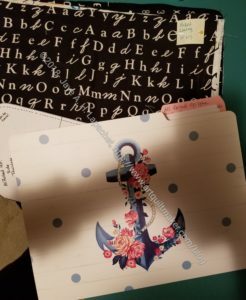 The club’s early bird special came with 2 free bonus projects, but I didn’t do anything until I saw an IG post by Angela and how much she had done! Then I was embarrassed, so I got busy. The first non-bonus project is the Roadtrip Bag. 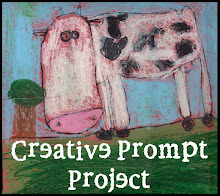 This one is made to clip onto a later project. I am trying to make the various projects coordinate. I originally thought I would put a rainbow stripe in each one like RockBaby Scissors does on many of her projects. I didn’t do it. I am just going with black, grey and white. I will be using some of the same fabrics for each of the projects. I think this could be used for a small-ish project. It would definitely be a good gift.